What the heck are those bulges underneath that bright green pant suit you are wearing Hillary? You know the one you wore when you couldn’t walk up the steps without assistance back in February? The suit that is in the viral photo that adds to the speculation that not all is well with your health? A private fundraiser was held at the house of Lisa and Joseph Rice in Charleston, SC. A picture of Hillary needing strong-armed assistance to walk up several steps has given more visual evidence that something is seriously wrong with Hillary. Her health appears to be a very real issue, with brain glitches that result in confused speech and disconnected thoughts, the inability to walk unassisted at times, and her chronic cough. However, Hillary will become president, even if it kills her, and it appears with her health issues becoming less easy to hide from the public, it will kill her. Though her doctor, Dr. Bardack, gave her a clean bill of health back on July 28, 2015 in a letter stating she was fit to run for president, her behavior suggests otherwise. 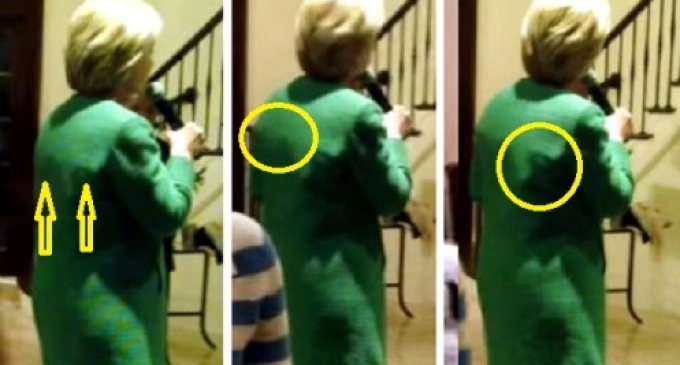 Check out the video that shows the bulges on her back under that bright green pantsuit on the next page. Some suggest that it is a life saving vest. What do you think? She got up late and forgot where her depends go ! I think it may be a bullet prof vest, Trump wears one. If she was Using a walker people still be Voting for her not because she is great , because she is a crook ! !